Today on 9th April J&K Cm Mehbooba Mufti blocked ex-cricketer Gautam Gambhir on twitter. Gautam Gambhir tweeted after getting blocked by Mehbooba Mufti “Most welcome @MehboobaMufti Ma’am, happy to be blocked by a callous individual. By the way, at the time of writing this tweet there are 1,365,386,456 Indians. How will you block them? Most welcome @MehboobaMufti Ma’am, happy to be blocked by a callous individual. By the way, at the time of writing this tweet there are 1,365,386,456 Indians. How will you block them? 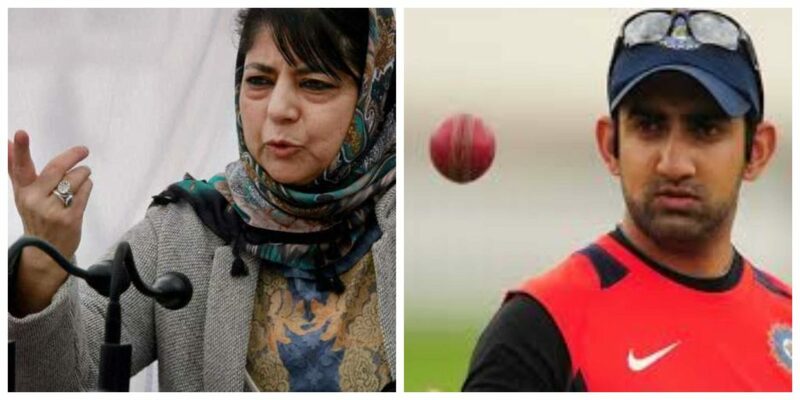 Gautam Gambhir expressed his emotion after getting blocked but there has been no statement made by J&K CM mehbooba about blocking an Indian cricketer who played for this country and enhanced the pride of the country as well by playing a major role in 2011 world-cup. As per the speculation, the reason behind blocking GG on twitter seems to be his long-lasting series of anti-muslim and pro-BJP tweets. Have look over the Gambhir’s anti–muslim tweets. Mannan Wani’s death: We killed a terrorist and lost a radicalised talent. @OmarAbdullah @MehboobaMufti @INCIndia @BJP4India all should bow their heads in embarrassment that they left a young man drift from books to embrace bullet. Gautam Gambhir had criticized Mehbooba for calling ‘Dangal’ movie actress Zaira Wasim unslamic and making her apologize. Calling @zairawasim "unislamic" for acting in Dangal or meeting @MehboobaMufti is naked suppression. Ashamed dat she had 2 apologise. Right after BJP released its manifesto for 2019 lok sabha polls. BJP’s announcement of vanishing article 370 came into limelight and stormed the brains of J&K politicians. From Farooq Abdullah, Umar Abdullah to Mehbooba Mufti everyone tried to thrash this decision of BJP and called it a dictator’s decision. All the above mentioned three leaders condemn the decision of BJP to abolish article 370. Have a look over Mehbooba Mufti tweets condemning abolition of article 370.